Few television shows are an immediate hit. The Bob Newhart Show was! Few comedy albums make it to #1 on the Billboard charts or win a GRAMMY Award for Album of the Year. The Button-Down Mind of Bob Newhart did. Few actors and comedians inspire generations of new talent like Bob Newhart either. DECADES salutes the 45th anniversary of The Bob Newhart Show and signature comedic style of Bob Newhart with a Weekend Binge event on Saturday, September 16 and Sunday, September 17, featuring continuing episodes of this enduring classic. DECADES will air 84 excellent episodes of The Bob Newhart Show back-to-back as the "Weekend Binge" starting at 1:00pm ET on Saturday, September 16, and ending at 7:00am ET on Monday, September 18. The Bob Newhart Show launched in 1972 in a highly competitive television comedy landscape that included the premieres of M*A*S*H, Maude, and Sanford and Son. Newhart's portrayal of psychologist Dr. Bob Hartley, combined with the brilliant performances of co-stars Suzanne Pleshette, Jack Riley, and the rest of The Bob Newhart Show cast, catapulted the show to instant success. Viewers across America tuned in each week to watch Bob play the "straight man" as he engaged in hilarious encounters with patients, neighbors, colleagues, and his lovingly sarcastic wife. Netflix announced, out of this year's Toronto International Film Festival, that it has acquired worldwide rights to director Chris Smith's fascinating deep dive into actor Jim Carrey's time spent portraying famed and complicated comedian Andy Kaufman. Using approximately 100 hours of footage shot on the set of Man on the Moon documenting Carrey's transformation into Kaufman for four months. The VICE Documentary Films production premiered at the 2017 Venice Film Festival and is produced by Academy Award - winner Spike Jonze, and VICE Films' Danny Gabai and Brendan Fitzgerald. 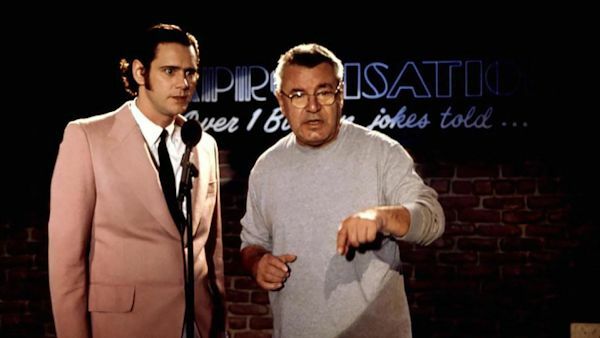 In 1999 Milos Forman cast Jim Carrey to play cult comedian Andy Kaufman in his biopic Man on the Moon. What followed was an intensely bizarre and emotional film production. Surrounded by Kaufman's friends and family on set, Carrey thoroughly "became" Andy and, alternately, Tony Clifton, Kaufman's obnoxious lounge singer alter ego. Much like Kaufman's comedy, Carrey's acting took on a performance art quality during the film. He never broke character on set, the cast and the crew referred to him as either 'Andy' or 'Tony' depending on who he was embodying (he had created complete and separate identities for each).